↑ "A Pale Blue Dot". The Planetary Society. สืบค้นเมื่อ 2014-12-21. ↑ "From Earth to the Solar System, The Pale Blue Dot". NASA. สืบค้นเมื่อ 2014-12-24. ↑ "NASA's JPL Horizon System for calculating ephemerides for solar system bodies". ssd.jpl.nasa.gov. Archived from the original on October 7, 2012. ↑ 4.0 4.1 "Mission Overview". starbrite.jpl.nasa.gov. สืบค้นเมื่อ 2011-07-27. 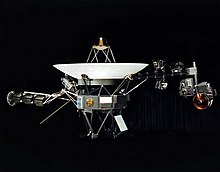 ↑ "Voyager 1". nssdc.gsfc.nasa.gov. สืบค้นเมื่อ 2011-07-27. ↑ 6.0 6.1 6.2 Sagan, Carl (September 9, 1990). "The Earth from the frontiers of the Solar system - The Pale, Blue Dot". PARADE Magazine. สืบค้นเมื่อ 2011-07-28. ↑ Butrica, Andrew.J (1994). "Chapter 11". From Engineering Science To Big Science (1st ed.). New York: Random House. p. 251. ISBN 0-679-43841-6. ↑ "An Earthly View of Mars". space.com. สืบค้นเมื่อ 2011-07-28. ↑ "It's our dot: For Carl Sagan, planet Earth is just a launch pad for human explorations of the outer universe". pqasb.pqarchiver.com. สืบค้นเมื่อ 2011-07-28. ↑ "An Alien View Of Earth". npr.org. สืบค้นเมื่อ 2011-07-12. ↑ "Voyager – Imaging Science Subsystem". Jet Propulsion Laboratory. NASA. สืบค้นเมื่อ 7 พฤศจิกายน 2559. ↑ "Cassini Solstice Mission – ISS". NASA. สืบค้นเมื่อ 7 พฤศจิกายน 2559. ↑ "Voyager 1 Narrow Angle Camera Description". Planetary Rings Node. SETI Institute. สืบค้นเมื่อ 7 พฤศจิกายน 2559. ↑ "Voyager Celebrates 20-Year-Old Valentine to Solar System". NASA. สืบค้นเมื่อ 7 พฤศจิกายน 2559. ↑ "PIA00452: Solar System Portrait - Earth as 'Pale Blue Dot'". photojournal.jpl.nasa.gov. สืบค้นเมื่อ 7 พฤศจิกายน 2559. ↑ "PIA00450: Solar System Portrait - View of the Sun, Earth and Venus". photojournal.jpl.nasa.gov. สืบค้นเมื่อ 7 พฤศจิกายน 2559. หน้านี้แก้ไขล่าสุดเมื่อวันที่ 11 มิถุนายน 2561 เวลา 06:04 น.